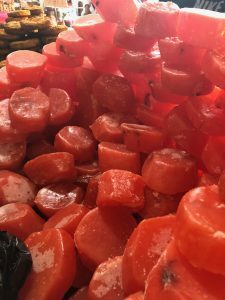 If, on your travels, you collect great food markets, you’ll quickly notice something unusual about Mexico City’s Mercado de la Merced: There’s very few tourists. 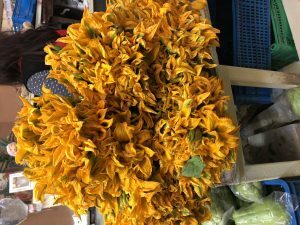 La Boqueria in Barcelona, Tsukiji in Japan, Shuk ha Carmel in Tel Aviv, the floating markets of Bangkok are all working markets that have resigned themselves to flocks of Instagrammers. Not Merced. We spent four hours touring the market, and in that time I noticed one other small group, iPhones out, snapping not shopping. In a city that welcomes tourists, several things keep them away from Merced. It is massive: seven covered buildings, each the size of four football fields, surrounded by streets and alleys covered with even more stalls and vendors. Chef Adrian Bercerril, our guide, told us it is the world’s second largest market. It turns out there’s no definitive ranking of such things, though Azadpur Mandi market in Dehli wins for most Internet superlatives. Even so, Merced is big, crowded and busy enough to be daunting to the average tourist. Adrian works for EatMexico, a food-oriented tour company based in Los Angeles and Mexico City. The company organizes regular Merced excursions, but limits each group to four people. 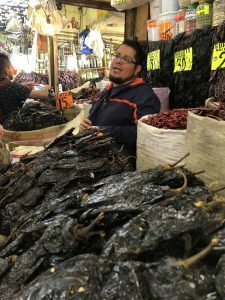 Squeeze yourself between a pile of pig skin, a mountain of nopales, hundreds of shoppers, vats of boiling oil and young men skidding hand trucks down narrow, food-slicked aisles with half a ton of avocados, and you’ll understand why. It has a reputation of having some iffy parts as well. At one point in our visit, Adrian stopped and told us to put away our smart phones. This was the market’s red light district, and if the pimps and workingwomen even suspected we were taking pictures, things would get quickly ugly. We obeyed. We stuck close. We sat when Adrian told us to sit, and I ate what he told me to eat. Even if that meant scarab beetles with garlic and lime, or steamed chicken intestines, or flies. Yes, flies. All the while, my head swiveled like a heavy camera on a loose tripod. Pottery vats full of menudo. Disks of pressed pork scraps the size of whitewalls. Knives flying against the spines of cactus paddles. Skinned cactus paddles flying through the air onto piles that came up to my nose. Pyramids of dark homemade moles, chiles dried, chilies fresh, chilies smoking up the air. Steam from the menudo. Smoke from the tacquerias. Heat rising off dozens of griddles where old Indian women stuffed mushroom fungus and squash blossoms into cheeseless quesadillas. A hallway of squash, a row of melons, a cloud of bees hovering over a sienna mountain of translucent, candied sweet potatoes. And those avocado flies, with their stiff clear wings, sitting on the upturned lid of a jar. Twenty five million people live in the greater Mexico City area, one third of the entire country’s population. Merced feeds them. So you can learn a lot about the country from its market. 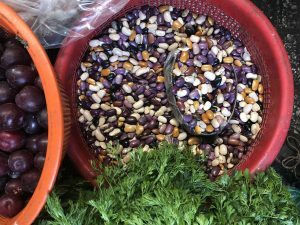 At Merced every peso is stretched, little food is wasted, and while native, traditional and local foods are cherished, so are the ingredients and techniques brought by immigrants and colonizers. Mexico is all there, in the market. It’s certainly in those flies. 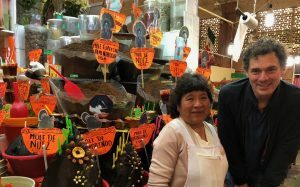 Somewhere in the middle of the tour Adrian stopped at a small counter, where Edith, a tired-looking middle-aged woman, showed us her array of pre-Hispanic ingredients and dishes gathered or made around Mexico City. Insects and freshwater fish were the only animal protein the pre-contact natives of the region included in their mostly vegetarian diet. The Spaniards brought goats, sheep, chicken and cows. Larger mammals like deer were rare and reserved for Aztec royals. That left things that crawl. Adrian started us on chapulines, or crickets, the gateway bug for the growing entomophagy movement. 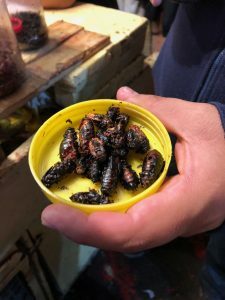 I‘d eaten so many on a previous visit to Oaxaca—not to mention on the antojitos platter at Gueleguetza in Koreatown – that he must have realized it was time for bigger, grosser things. Jumiles are beetles. “They’re pretty,” I said. They were the size of a Manhattan cockroach. Their dark-roasted carapaces caught the light and reflected it back with addded greens and purples. Their rows of tiny legs were creased inward at sharp angles. These were delicacies, Adrian explained, expensive and seasonal. He dropped one into my palm. I tossed it in my mouth, and crunched. The flavor was a pleasant surprise. It tasted like a fried shrimp shell. Actually, except for the fact that I was eating a beetle, it tasted good. Mexico City was built over a lake that used to provide small fish. Edith let us sample a fish tamale, which was a cornhusk filled with nothing but whitebait, sealed and roasted. Opened, it was a dish designed by Arcimboldo, a single brain-like mass which, on inspection, was composed of maybe a hundred clumped-together fish. I pried one loose. It carried the flavor of corn and smoke. Also delicious. “Try the flies,” Adrian said. Once a year the flies are harvested from avocado trees, another native plant. Compared to houseflies, they are more triangular, like a Concorde beside a DC-3. Their wings and bodies were roasted dry and stiff. They looked exactly like something you’d find at the end of an expensive fly rod. Adrian said the locals call them peroquitos, or little parrots, and each one costs 18 pesos, one dollar. And they tasted like gribenes. Small as they were—and I had two just to be sure—each packed in the flavor of a shard of crisp fried chicken skin. Adrian loved the market, but I think he loved the native foods the most. We stopped to sample tlacoyo. An elderly woman slapped a piece of blue masa into a cactus paddle shape, working a filling of mashed fava beans into the center as it flattened. Then she put it dry on a hot grill. Just before serving, she topped it with crumbled cotijo cheese and a sharp green salsa. 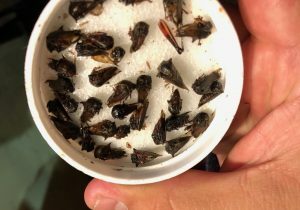 I bring up the insects not for the shock value, and certainly not because they were representative of what people offered or ate at the market. The popular foods there were what we know and love here: suedero, or flank steak, tacos that drew crowds, uniquely Mexico City quesadillas, made without cheese, birria and burritos. From what I saw, there were plenty of stalls offering sacks of Cheetos the size of twin mattresses. But that’s why the insects matter. The modern Mexican diet is heavy on meat, sugar and processed food, light on tlacoyos. The country has one of the highest rates of obesity and Type 2 diabetes in the world. Among chefs and the pubic, there’ a growing sense that the Aztec diet, which was largely vegan-plus-insects, could point the way to a much healthier future. Those foods haven’t disappeared, Adrian said. The market is stuffed with cactus, chile, corn, beans, squash and avocado – all things that sustained the Aztecs for centuries. “We need to learn to eat them again,” Adrian said. I noticed one stall whose shelves were piled with what looked like massive yellowish white wheels of cheese that had just been pressed together from squiggly curds. “What are those?” I asked Adrian. He explained that the vendors took all the scraps from butchering pigs—bits of skin, extra fat, muscle, whatever—and pressed it into these wheels. The wheels were sold to restaurants and tacquerias, which deconstructed them over time, chopped the scraps even more finely, and grilled or fried them for tacos and other dishes. “We don’t waste,” Adrian said. A massive pot of pancita. The pits of the mamey fruit were scraped and repurposed into an almond-scented hair conditioner. Older fruit was fermented into a strong-smelling paste, or boiled and candied. And numerous stalls were set up to serve parts of animals Americans feed to dogs. 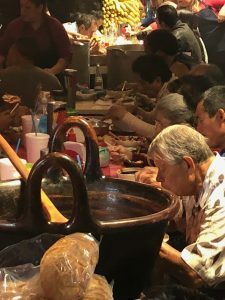 There were long tables of diners enjoying a morning bowl of pancita, the Mexico City word for menudo, made from the stomach lining of the cow. And by mid-morning, a cow skull on the table of another taco stand, looking like it had popped off a Georgia O’Keefe canvas. The tacquerio had picked its meat clean for the morning head taco rush. Wait, one more thing. At Edith’s pre-Hispanic stall, Adrian offered me a thin flesh-colored tube. At that point, I had wished he said, Yes, worms. But I trusted Adrian, and swallowed. The chicken guts tasted just like chicken. We don’t waste. We tasted far more acceptable examples of Merced Market thrift. One was Tacos McTeo, a now-famous stall that claims to have invented the French fry taco. The cook stuffs your corn tortilla with a heap of fries made fresh along with your grilled meat. You top it with salsa, fresh radish and a squeeze of lime: delicious. The idea came about during an economic downturn in the Nineties, when vendors wanted to help people fill their stomachs more for the same money. Not only did the French fry taco catch on, even more miraculously, McDonalds never came after the little stall for incorporating the Golden Arches into its logo. Down the same alley (I think) we sat for another Mexico City innovation, fried tamales. Day old corn tamales filled with either pork, chicken or roasted red peppers, get dunked in boiling oil. “This gives them a new life,” Adrian explained. Three bites and I was stuffed. Then I finished it. We moved on to Dona Balbi’s mole stand. Adrian said Balbi family, from Pueblo, made what he considered to be the finest moles in the market. We tasted small spoonfuls. The green was a complex blend of pumpkin seed, cilantro, something citrusy—honestly, who knows. Another tawny mole had the flavors of pumpkin seed, roasted chicory, tamarind, and chilies. I asked for a second spoonful. Then I bought a half-kilo of each. Dona Balbina, her moles, and me. In four hours we saw just part of one market building. Our last stop, Adrian warned us, would be swarming with bees. The stalls were piled high with Mexican sweets. The most beautiful were chunks of green squash and orange sweet potatoes that had been cooked in sugar until they turned translucent. It was a technique the Muslims brought to Spain during the conquest, and that the Spaniards brought to Mexico – a reminder said Adrian, that Mexican culture and cuisine itself is multicultural. Mexicans learned to candy vegetables from the Spaniards, who learned it from the Arabs. At the end we regrouped at a nearby restaurant, Roldan 37. It belonged to the family of chile merchants, which repurposed a converted warehouse into an airy, high-ceiling space. Adrian ordered us a plate of Pastel de Dioses, a mix of avocado, requesón cheese and chapulines in an empanda, and some beers. We clinked bottles.